I liked everything about this Hotel. It was big and modern with a nice restaurant and it was close to everything. The breakfast was great with a lot of variety. The staff very nice and helpful. Good location. Close driving distance to the zoo and most major attractions. Nice that it was close to a Tim Hortons, McDonalds and a grocery store. Complimentary breakfast had a nice variety. The water slides are a hit with the kids. Breakfast was also well priced for a family of four. Kids loved the slides and pool. The room looked great and staff service was great!! Staying here with my wife for just one night. Clean and comfortable. Just a little dated. Good location, and have free underground heated parking. Sunridge Mall is close by also within walking distance. Close to Sun Ridge mall and restaurants. Close to Sunridge Mall and somewhat close to Marlborough Mall. sunridge mall is close,also a theater is close too. Nearby there are lots of restaurant options, and is very close to the Sunridge Mall. Sunridge Mall is located in a vibrant area of Calgary known for its beautiful river views and popular zoo. Calgary is home to 351 hotels and other accommodations, so you can find something that's perfect for your stay. Ramada Plaza & Conf Center by Wyndham Calgary Airport: With a stay at this 3-star hotel, guests can enjoy access to free breakfast and a restaurant, along with free WiFi. It's a favorite with Expedia travelers for its bar and overall value. 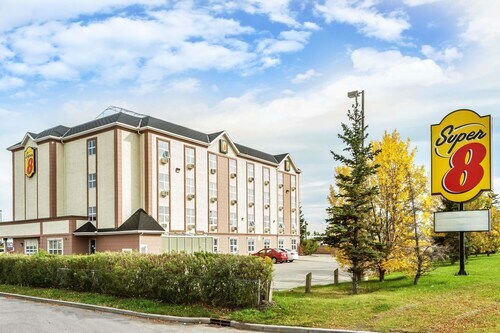 Super 8 by Wyndham Calgary/Airport: This 2-star motel features free breakfast, free WiFi, and free parking. Our customers like its overall value and pool. 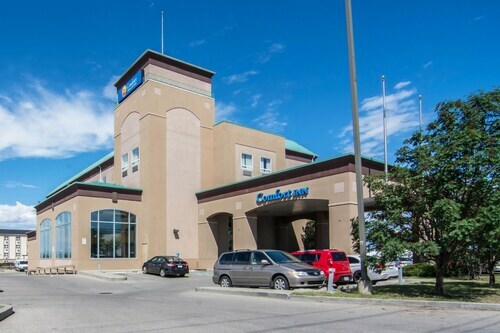 Days Inn by Wyndham Calgary Airport: With a stay at this 2-star hotel, guests can enjoy access to free breakfast and an indoor pool, along with free WiFi. Our customers like its overall value and convenient parking. After you've visited Sunridge Mall, you can explore the sights and attractions within just a few miles of the area. You might want to spend some time browsing the exhibits at Aero Space Museum of Calgary, The New Gallery, or Glenbow Museum. Calgary Tower, Centre Street Church, and Fort Calgary Historic Park are landmarks that you won't want to miss. You can check out the local talent at Loose Moose Theatre, Alberta Theatre Projects, and EPCOR CENTRE for the Performing Arts. Calgary Zoo and Scotiabank Saddledome are both worth a visit while you're checking out the area. You might also stop by Stampede Park, located 4 mi (6.4 km) from Sunridge Mall, or University of Calgary which is 6.5 mi (10.5 km) away.